Drakensberg & Royal Natal NP, the Freestate. (South Africa, Botswana, Namibia, Lesotho and Swaziland). We did the route from Lesotho border (Caledons Poort) to North Drakensberg in 4 days, stopping and relaxing for a couple of days. 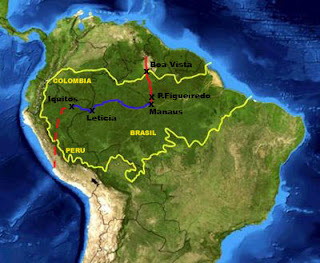 It´s around 150 km. We drove from Caledons Poort to Fouriesburg, Clarens, Golden Gate National Park and continue to north Drakensberg (Royal-Natal National Park). You´ll find it in Lesotho (go if you are travelling in the area, read the complete information about this countru in our blog). And for sure all along this route crossing the Golden Gate National Park and around the Drakensberg. Probably, the greatest views of South Africa. Super scenic routes in this area of the country and at least in november, really empty! It´s a small town, 10 km from the Lesotho´s border at Caledons Poort. A few lodges in town, also guestfarms on the way to the border and to Clarens. 2 small supermarkets, a butchery, a few shops, gas station, bank. Just a main short street but you will find everything needed. We liked it! Authentic! We liked the place, quiet camping, an interesting walk around, we finally stayed there a couple of nights. Where to camp near Fouriesburg? We stayed at Meiringskloof Reserve campsite: Price for camping: 164 R/2p. Big campsite, lots of trees and water streams, cliffs. Big pool. Even a loop, an hiking trail (with a chain ladder to climb the cliff). 40 km east of Fouriesburg and 20 km west of Golden Gate NP, a super tourist town. Almost every house is a B&B or lodge. The main street full of restaurants, galleries, antiques. It´s a favourite and popular "slow" place for white South Africans on weekends, always crowded. Not many options to camp there, try maybe in the backpackers. Beautiful sandstone cliffs and road. Not too many animals, just a few zebras, antilopes, wildbeests. The walks can be interesting if you camp or stay there, otherwise it´s better to keep energies for Drakensberg. An interesting, beautiful and free route (no need to pay NP fees if crossing the park through R712) when connecting Lesotho and Drakensberg, nice scenery. Price for the Conservation Fee: 152 R (included with Wild Card, managed by SAN). If you camp there (hotel or camping) you have to pay it! So, more than a national park (small, few animals and walks), it´s an exclusive area (there´s a luxury hotel), something extra with your accommodation. Note: if looking for cheap accommodation, it´s better you continue to Drakensberg. You are also “supposed” to pay the fee if you want to do the hikes or do the small game loop but there are no control gates or indications. If you just drive along the main road R712, you see almost everything, as there´s just a small game loop road), it´s free, just a check-point when coming from Clarens. There´s a natural pool to swim behind the main camp at Glen Reenen. Where to sleep inside the Golden Gate NP ? Managed by SAN, the hotel is very expensive, so if you are a low-cost traveller, the option is to camp. The campsite costs 180R/2p (plus the entrance fee! Not cheap, except having the Wild Card). Just near the main road, at Glen Reenen (so maybe a bit noisy even if light traffic). We were very lucky and we stayed at the hotel of the Golden Gate NP (staff house), with François and Gerrit, chef and manager. They are in Couchsurfing and are very good hosts. Great hospitality! After Golden Gate National Park, you continue on R712, passing Qwa-Qwa area. This is the crossroad to reach Sentinel Park, tarred road (we explain it latter in detail). R712 finishes south of Harrismith (if you head to town 13 km north you will find supermarkets and accommodation) where you follow R74, with great views over the huge Sterfontein Dam (there´s a reserve with a campsite) and you will pass the Olivershoek Pass. Beautiful route! Here start the great views of the Drakensberg. Warning: The R74 road was left under works (construction problems, lack of money...) near the dam so there are around 20 km of gravel section, but fine to pass even with a sedan car. Just drive slowly. Maybe one day the road will be finally re-done! This is Africa! On the R74 25 km north of Bergville is the crossroad to Royal Natal National Park (tarred). And further south, all the other roads heading to the different Drakensberg valleys. We only followed tarred roads. To have an idea, it´s around 100 km between Golden Gate and Royal Natal parks, but you need time to drive and enjoy the views. Around Kwa-Kwa and the Drakensberg mountains, you will see traditionnal african villages and huts. It´s a black populated area, rural, where things haven´t change too much (roads are still bad and unpaved mainly). Interesting area! We always felt very safe around. If you like nature, mountains and hiking, Drakensberg is a good place to enjoythem in South Africa. Big rocky walls, waterfalls, nature, just at the east limit with Lesotho. The Drakensberg mountains are divided in many nature reserves and one national park. Royal Natal National Park, Monks Cowl, Champagne Valley, Giants Castle, Highmoor, etc. All managed by Ezemvelo (Kwa-Zulu Natal arks management). Check www.kznwildlife for the complete information. The price for the entrance is 35 R in each one, it´s included with the Wild Card, there´s no Drakensberg complete pass. If limited in time and money, you just have to choose one or two places to visit. And also cause each reserve has a different access road. 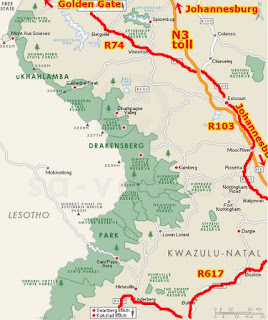 In Kwa-Zulu Natal, if you camp inside the reserves (overnight visitors) you don´t pay the entrance fee appart (as it´s usual in other South African regions). It´s better you have a car as the gates, camps and starting points for walks are quite spread out, a few km away. And public transport is really very limited. Most of the tourist vans stop in the lodges around. The main roads are tarred, but many potholes. There´s no loop road. From the main roads (R74, R103) you have to follow different small roads to reach each valley and reserve, for around 30 km. This small access roads are not always tarred. The roads are tarred to get to Royal Natal and Monks Cowl and for other reserves some sections are gravel roads. Always do some research specially if driving a sedan car and raining. Check how much time you have! The road from Northern Drakensberg to Southern Drakensberg is not tarred. You will have to follow the main roads R74+R103+R617 via Bergville, Escourt, Mooirivier, Pietersmaritzburg, Underberg to have full asphalt. It´s a long detour (250 km from Berville to Underberg). Ask around about the roads situation. The Drakensberg is just at the east limit with Lesotho. The famous Sani Pass in Southern Drakensberg (from Underberg- Himeville) to get to Lesotho is only for 4x4 but there are plans to do a new tarred road. Check!No more border crossing roads between South Africa and Lesotho in the Drakensberg- KZN area. You have to go further north to Free State at Caledons Poort or further south to Eastern Cape at Matatiele & Qacha´s Nek. Long detour. Many lodges in the Drakensberg area organise day trips to Lesotho, some by road crossing the Sani Pass, other hiking through the mountains. It´s a tourist destination for South African during school vacations, specially the northern part of Drakensberg, so, at that time the place gets very crowded and booking in advance important. The N3 Johannesburg to Durban is a toll road. But possible to use alternative routes (we did not use N3 at all... save many and had no heavy traffic!). WHERE TO SLEEP IN THE DRAKENSBERG ? Most of the reserves have accommodation, from campsites to luxury rooms, managed by Ezemvelo (you can book online). There are also private lodges in the surrounds. If travelling on a budget, there are also a few great backpackers lodges around: Amphiteatre (north of Bergville), Inkosana (Champagne Castle), Drakensberg International (Giant´s Castle), Khotso (Underberg). 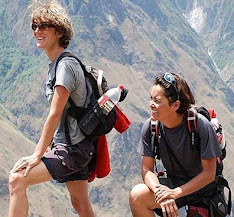 The cheapest accommodation option is camping, also possible in the backpackers lodges. Royal Natal National Park (inside): Mahai campsite is 255 R/3 p and Rugged Glen 180 R/2p (a bit outside the main gate, about 5 km, it´s also a horse stable with activites, on D119). Thendele has just rooms. 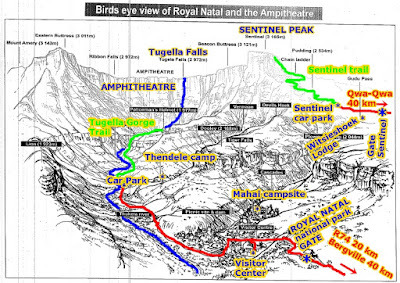 Royal Natal National Park (outside): the cheapest option is probably Amphitheatre Backpackers Lodge . Really great! We stayed there a couple of nights. It´s a “5 stars” backpackers lodge, on the main road R74, 21 km north of Bergville and just 4 km south of the access road to Royal Natal, around 30 km to the gate of the Royal Natal National Park. Prices: 85 R/pp for camping, 140 R/pp for a dorm (also rooms, more expensive)..
Big, clean, different kitchens, BBQ, pool, jacuzzi, sauna, lounge, restaurant… and Amphitheatre and Drakensberg views from the plain. A very good place! Super-recommeded! WHERE TO GO IN THE DRAKENSBERG? We explained about the reserves, fees, roads, distances, etc. in the Drakensberg. Cause we were driving a sedan car and not all the roads are tarred and good, and cause we didn´t want to do too many detours and km, and the weather was changing quick, we just decided to visit the Royal Natal area in the northern Drakensberg area. It´s really beautiful! It´s a great option if you have to choose only ONE place in the Drakensberg. Really recommended! Very complete area! Views, accommodation, hiking down and up area, easy access by sedan car. Warning: always check the weather forecast when visiting Drakensberg. The weather conditions can change very quick and suddenly. Drakensberg is famous for its thunderstorms, plenty during summertime. The earlier you start hiking the better. Usually after noon, more rain. Always bring warm and rain clothes. Even summer time! In winter, expect snow up in the mountains. We experienced all this, believe us! This is the area we chose in the Drakensberg. The landscape is really beautifull. Huge cliffs,peaks, gorges, falls. You can´t be dissapointed. Admire the famous “Amphitheatre”, 5 km long rocky wall and 1.000 m high. See the Tugella Fall, the second longest waterfall of the world, 948 m long in 5 drops, even from far away, you´ll see it (specially after a heavy rain). Head up to Sentinel, driving to the car park or hiking up to the peak. This and much more is what is waiting for you in the area. The interesting and complete thing is that you can visit the high and low parts here. Sometimes it´s not very well explained as it´s a bit weird. And many people miss the upper part, what a shame, both worth going! Or join a tour cause the lack of information. We will try to do our best to get things clear. In fact it´s really simple and easy! The high part, called Sentinel, is private, owned by the Witsieshoek Mountain Lodge. The low part is the Royal Natal National Park. There are tarred roads heading to both places. And if you like walking, nice trecks and better views than by car! Here´s a map to try to understand better everything. It´s the low part of the Amphitheatre (around 1.500 m altitude). It takes around 20 km from the main gate to R74 (the crossroad is 25 km north of Bergville). Entrance fee: 35 R/pp (included with the Wild Card). There´s a visitor center and accommodation (as explained before) managed by Ezemvelo. Spread out, better to have a car. You have interesting walks in the Royal Natal National Park, different ones, from 1 to 6 hours or more, so you have many options if you like the mountains. Ask at the visitors center. They have maps (some are free). If you have to choose one walk in the park, this is a must-do. Around 5h30 return, to get to teh Tugella Falls bottom. The trail starts from a car parking close to Thendel Camp, where you have to register (there´s a ranger, he told us the trail was OK... not too many explanations). The first part of the trail is a very good path, open valley following the Tugella river, no steep. Incredible views of the Amphitheatre peaks. The final section is harder, when you reach the gorge properly. If the weather look bad, it´s better you just walk til this point and go back to the car park. The trail further is not so well marked, you need to go down to the river and cross it a few times. At the end of the gorge, the river becomes very narrow between rocky walls, kind of natural tunnel (some people go inside, walking into the wate or swimming, it´s more than 50 m long; we didn´t, the water level was high and the water cold). There´s a chain ladder just at the mouth of the tunnel (right side) and a wood and chain ladder (left side). The ranger told us the left side was easier. We took the chain ladder. At the top of it, it´s a steep and vertical climb through roots and chains. This is the point we reached when a terrible thunderstorm started (the sun was shining 5 minutes before). Incredible sounds in this amphitheatre! And water was falling everywhere, the river was really higher. We had to go back. But we imagine the Tugella Fall bottom and closest views were no far. Beautiful walk! Just, be very careful with the weather. The sooner you start the better. We started at 8:45, too late maybe…The weather was perfect, just a few clouds, but the thunderstorm started suddenly before noon! Witsieshoek Mouantain Lodge (they control the gates and trails with local people of the area). Access is via Phuthaditjhaba/ Qwa Qwa (or Kwa-Kwa in some maps) coming from R712. The gate is 30 km away from the town following R57 (tarred road).Sentinel car parking is around 8 km from the gate, the last km are not pavimented yet (under works in december 2014), fine for a sedan car exept a few sections (drive slowly). Note: as we were coming from the north, from Golden Gate National Park, we first visited Sentinel area and latter, next day, Royal Natal National Park. Entrance fee: 25 R/pp (not included with the Wild Card, it´s a private access). Here´s a map to have an idea of the Sentinel area. It´s the way to go up and discover the upper Amphitheatre. The highest point is called Mount-aux-sources (3.282 m). For sure, you will enjoy the drive and views going to the Sentinel Car Parking. You will reach almost 2.500 m with your car. The hike it´s at least a 6 hours return hike from the car park to the top. You are at the top of the Amphitheatre, you can keep walking there! One of the best hikes in the Drakensberg. You don´t need a guide. The trail is well marked, long zigzags up at the beginning, sometimes different alternatives. The final steep climb is through chain ladders (around 2 h from the start). Check our map and get on idea (they also have maps at the car park, ask the rangers). But, if you prefer, you can get a guide at the car park. Also many people join tours in the different lodges of the Drakensberg. 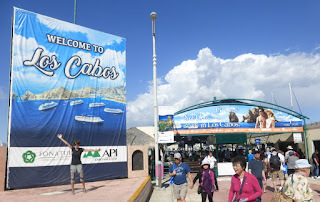 Beginning of december (still low season), there were a few tourists around (most of them tours) and school groups. You will not be alone! Once you reach the top, depending on your energies, time, weather, etc. it´s more or less flat there and you can walk further, maybe to get views of the Tugella Falls from the top (remember the Amphitheatre is around 5 km long). At the parking area, there´s a small basic hut on the top, 1.5 km further the chain ladders.To reach Mount-aux-sources, it´s 4 km further west from the hut. It´s popular to stay there at the top for the night, many people camp (extra 50 R pp). Remember it can be very cold and rainy. They climb in the afternoon or morning (depending how far they are going) and then go down early morning. Check the weather forecast, ask the rangers and always keep a view to the skies. The weather changes so quick up there, fog, mists and storms come up in minutes. Our experience: we just try to reach the chain ladders, but the weather got bad, fog, rain, hail, and we had to go back. We didn´t reach the top. Next time maybe! But the place and hike is fantastic! 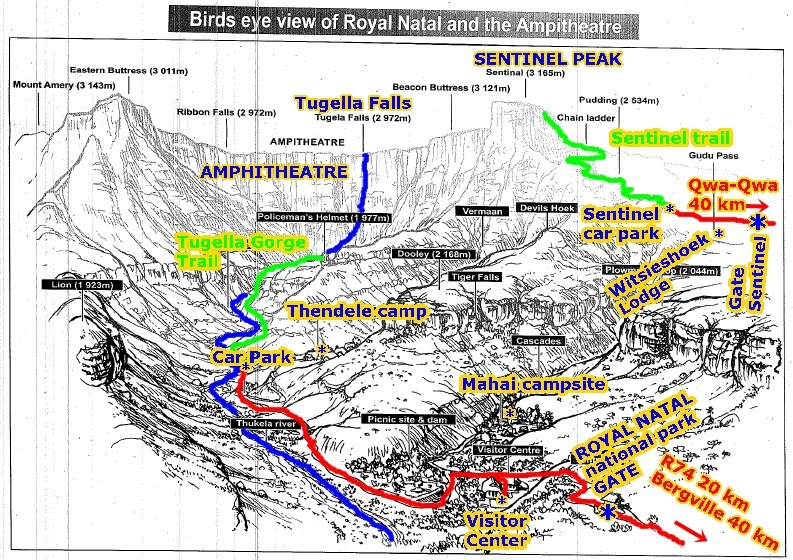 From Sentinel Car Parking to Royal Natal national park is around 130 km drive (more than 2 hours), when it´s looks so close on the map! You have to drive back to Kwa-Kwa, continue east on R712 til it finishes south of Harrismith, follow R74, passing the huge Sterfontein Dam (the 20 km unfinish works road, OK with a sedan), pass the Olivershoek Pass. 25 km north of Bergville on R74 is the crossroad to Royal Natal National Park. All the roads are tarred. It´s possible to walk between Witsieshoek Lodge and Royal Natal but really long (maybe more than 10 hours). And who knows if the trail is good. Too much! Only for adventurous and better with a guide. Where to sleep in the Sentinel area ? Overnight at the parking car : there´s a small and basic building, they have dorms (65 R/pp). There´s no shower, only WC. No kitchen, but you can always ask the rangers... and share. Bring food! No shop! Overnight in the mountain is 50 R/pp/day. There´s a hut on the top (1.5 km after the top of chain ladders), many people bring their tents, you have to be sel-sufficient. Sentinel is high in the mountains: if you sleep at the car parking and specially on the top, carry a good sleeping bag and enought warm cloth. It´s very cold. And also food already cooked, they don´t have kitchen. Warning: carefull with the weather conditions. Specially if sleeping on the top! Ask! Check! If you want to climb Sentinel Trail for the day, the best option is to sleep at the Sentinel Car Parking and start very early in the morning when the weather conditions are usually better and fine.We were at the car parking around 9:00, too late (the weather got bad before noon), coming from Golden Gate NP (where we slept). We didn´t know it was possible to sleep in a dorm at the Sentinel car park... Once you finish your hike, depending on the time, if late stay one more night there, if quite early go do to Royal Natal lower area (around 1h30 drive) and search for nice accommodation (for exemple, Amphitheatre Backpackers, with a great hot shower). Enjoy the Drakensberg! It´s one of our favorite places in South Africa, really great!